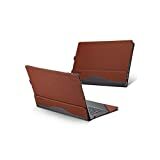 The first thing you should do after you purchased a Lenovo Yoga 720 is to look for a suitable laptop protection such as a case, a sleeve, backpack, a messenger bag, or a briefcase. It will keep your laptop safe and last for its entire lifespan. Made by Lenovo and designed for Lenovo Yoga 720 13” and 12”. Slim and light easily fit in your backpack. A large pocket for storing your mouse, adapters, and pens. 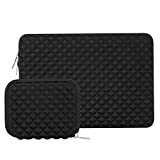 Lenovo made an easy way for you to protect your lightweight Lenovo Yoga 720 13-inch laptop by recommending its own slim and light laptop sleeve. 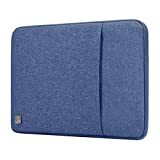 The sleeve features durable and soft touch fabric help protect laptop from scratches and drops. It also features a unique and stylish design with Lenovo logo right front of the sleeve. 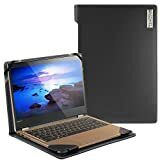 It available in many sizes made to fit every Lenovo laptops including a 13-inch version for fitting the Lenovo Yoga 720 13”. In addition, it has three main pockets for storing your laptop, mouse, pen, chargers, adapters, cables, and so on. The best light-weight protection for Lenovo Yoga 720. Designed perfectly to fit 13.3” Lenovo Yoga 720 13-inch only. Made of high-quality translucent DOW polycarbonate material. Comes in two pieces for top and bottom cover. Work in all 2-in-1 laptop modes. 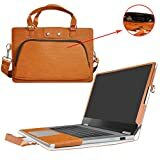 If you want a lightweight protection that can protect your laptop all the time, easy to install and remove, there is a case cover can do this. 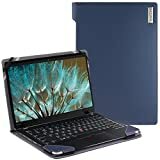 This iPearl mCover hardshell case here is perfectly designed to fit the 13.3-inch Lenovo Yoga 720. It made of high-quality translucent DOW polycarbonate material that can protect the laptop all around. Every ports and button are all accessible without removing the case. It comes in two pieces separately for the top and bottom. Perfect lightweight protection for traveling. Best protection with ultra-thick, yet lightweight design. Easy carrying with included handle strap. Two large front pockets for storing your laptop accessories. Available in black, pink, burgundy, light gray, and cobalt blue. If you want a perfect protection with a minimalistic design and having enough space for your accessories, this Tomtoc sleeve briefcase will be the best choice for you. It features the CornerArmor™ Patent which is excellent in protecting your laptop in any accidents. 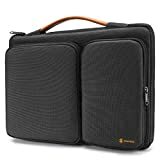 Unlike most laptop sleeve, this sleeve has two large pockets sealed with high-quality zippers make sure your accessories stay safe with you on the go. Within each pocket, there are different slots easily for keeping your pen, cards, charger, adapter, cables, phone, and so on. Made specifically for 13.3-inch Lenovo Yoga 720. Made of high-quality PU leather exterior and soft microfiber interior. Designed to allow full ports and buttons access. Available in gray, blue, brown, coffee color. The most important use case of a laptop case is it allows you to access your laptop instantly without taking it off. 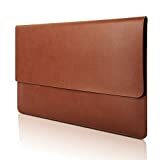 This PU leather folio case from Veker is designed to fit perfectly with your 13.3-inch Yoga 720. Every I/O ports and buttons are all easily accessible without removing the case. The case made of premium PU leather painted in multiple color options including gray, blue, brown, and coffee. The interior made of soft microfiber protect your laptop from any scratches. The one downside of this case is you can’t turn your laptop into tablet mode. Specifically designed for Lenovo Yoga 720 (Not fit 710 and 720 15” and 12”). Built-in hand straps and removable shoulder strap. Secure your laptop with two strong elastic rubber bands. Made of high-quality PU fabrics exterior and soft fabric lining interior. Available in black, blue, brown, purple, and red. Sometimes it’s really difficult in choosing cases, sleeves, or bags for your laptop. If you are in that such situation, this portable carrying case seems to fit in. This case is made specifically to fit precisely for the 13.3-inch Yoga 720. You can use your laptop without removing the case and every ports and button are fully accessible. It has large pocket allows you to store all your laptop accessories including power adapter, mouse, phone, and pen. This case is also designed to allow air ventilation with accurate hole positioning. This case made of high-quality PU fabrics exterior and soft fabric lining interior for better protect your laptop from scratch and bump. The most favorite affordable laptop sleeve. Protect your laptop from bumps, debris, scratch, and accidents. Top-loading zipper for easy retrieves your laptop. Easy to carry or slide into the backpack. Available in black, blue, grey, navy, and purple. Made of water-resistant material and smooth inner lining interior. Large front pocket for a power adapter, phone, tablet, pen, and cable. Padded zip binding protects your laptop from scratch. Available in black, grey, military green and blue. Slim sleeve with multiple pockets. Made of waterproof nylon canvas fabric. Side handle strap for easy carrying. 2 compartment, for a laptop and tablet or documents. 3 front pockets for keeping phones, mouse, pen, and accessories. Available in space grey, hot pink, navy blue, pink, and grey. Diamond protections style with additional storage pouch. Diamond padding style for great bump and shock absorption. Comes with a small storage pouch for storing your all accessories. Slim and lightweight easy for carrying around for slide into a backpack. Available in Black, Gray, Airy Blue, Rose Quartz, Purple, and Mint Green. Vegan leather exterior and soft microfiber interior. Using your laptop without removing the case. Every ports and button are all accessible without removing the case. A rear access slot for hot air dissipation. If you don't have an account on our forums, you can use this comments section to share your issues, solutions, or any ideas related to the “Best Lenovo Yoga 720 13” Cases and Sleeves for 2019” topic.